Is Lebanon a failed state? The expression went mainstream thanks to the US’s foreign policy, notably its military interventions in Somalia (Restore Hope in 1992) and in Afghanistan (Enduring Freedom in 2001). Noam Chomsky in his book Failed States: The Abuse of Power and the Assault on Democracy (Metropolitan books, 2006) being the semanticist that he is, showed the uses and abuses of this qualification by the American administration. So we know that the expression was quite useful to the US. But does that condemn the expression to an instrumental use in politics? Can it help us otherwise better understand the countries that are designated as “failed states” ? Let’s look into some indicators before trying to see how pertinent and significant it is to call Lebanon a failed state. 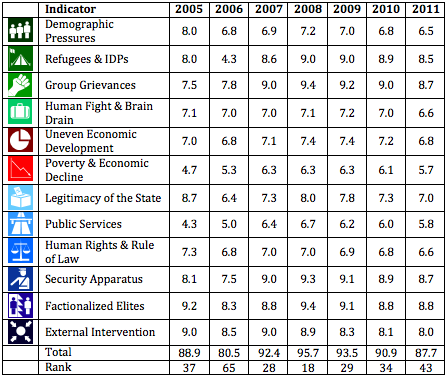 I came across these indicators developed by the Fund For Peace for its annual index of Failed States: Demographic Pressures, Refugees & IDPs, Group Grievances, Human Flight & Brain Drain, Uneven Economic Development, Poverty & Economic Decline, Legitimacy of the State, Public Services, Human Rights & Rule of Law, Security Apparatus, Factionalized Elites, and External Intervention. Looking into their index, we notice that they ranked Lebanon #43 in 2011, after ranking us #34 in 2010, #29 in 2009, #18 in 2008. So basically, we’re climbing higher and higher in the ranking… so things are looking good for us, if we trust these results. But do we? Does anyone feel a sense of positive progress in Lebanon? I know I don’t. So either my impressions are wrong or the Fund For Peace rating lacks accuracy or pertinence. Its normative aspect. Lying behind the stated indicators are the assumptions on how a state should be. And quite obviously, this model doesn’t take into account multi-ethnic societies where national identity cannot erase communal identities, and civic ties do not eliminate communal ties. But these are not necessarily mutually exclusive categories, regardless of what our “analysts” or should I say doctrinaires keep on rehashing. Its dependence on exterior, or visible markers while some dynamics are less overt but sometimes more significant. How much informal politics can it monitor or grasp? How deep is its access to information? A blog entry is no place to look into the accuracy of such processed data or the pertinence of the indicators. But let’s me say a word about the usage of this designation. Those who claim that Lebanon is a failed state are usually the same people who argue that there is no citizenship (or citizen rights) in Lebanon… This approach is actually quite prevalent in Lebanon. A friend of mine sums it up under the heading “وين الدولة” (“where is the state”) which is often heard on television and on the streets when citizens voice their grievance. This claim about the state’s absence is equally widespread in academic and NGO circles. And so we hear “نحو المواطنية”، “بناء دولة القانون والمؤسسات”، “القيام بالدولة “، “من اجل المواطنية”… as if neither state nor citizenship existed. This approach is undeniably normative. It goes beyond expressing one’s dissatisfaction with the state’s performance. Actually, it circumvents this question by denying the very existence of the state or citizenship. The reason why the state’s existence (or citizenship) is denied is not grounded on facts. Any liberal would rightly argue that there is actually too much state in Lebanon. It’s an abstract, normative judgement based on a specific idea of what a State (or citizenship) should look like. It all boils down to the fact that many people are displeased by some feature of the Lebanese state that they attribute to what people call “confessionalism”, or more derogatorily “sectarianism” or more neutrally “communalism”. So all this name-calling is actually grounded on a dislike of communalism in all its manifestation, social, legal, political. Paradoxically, the same people who combat communalism pride themselves in Lebanese diversity. So basically, they want to celebrate plural society but fight any of its manifestations.